The March General Meeting saw the announcement of the Washington Apple Pi 2009 Photo Contest. The Pi’s first contest, two years ago, proved to be one of the most successful events ever held, with wide participation from new members, old members, local members and remote members. The contest also revealed the sheer raw talent of the Pi membership; even the photos that didn’t win prizes revealed that our members are a very accomplished group. Lesa Snider King prepares for her presentation while sitting next to her mother, who came to see what it is that her daughter does. Photo by Richard Sanderson. Coincidentally, Lesa Snider King was scheduled for her fifth (?) appearance at Washington Apple Pi. Lesa is widely acknowledged as one of the premier masters of making Adobe Photoshop and Photoshop Elements sing, dance, and play the piano. But her truly extraordinary gift is being able to explain to others how they, too, can make Photoshop sing, dance, and play. Lawrence Charters conducts a Question and Answer session at the start of the March General Meeting. This photo, by Dan Lehman, was taken with a Panasonic DMC-LX3, a digital camera designed to take photos in 16:9 ratio, the same ratio used by high definition digital TV. Q.: What is all that construction on the Virginia side of the Beltway? A.: HOT (High Occupancy Traffic) lanes are being constructed. Q.: Why do you dislike DiskWarrior? A.: It isn’t a question of disliking DiskWarrior. But as Paul Simon suggested in his song, it is a one-trick pony: it is a powerful tool for reconstructing damaged directories. It is not a general-purpose drive diagnostic tool. Apple’s Disk Utility (in the Applications/Utilities folder) should be your first stop in checking your hard drive; DiskWarrior should be possibly your fifth or sixth stop. If you attempt to rebuild a directory on a drive that has defective sectors, for example, DiskWarrior will rewrite the directory for the entire drive – and possibly irretrievably damage all the data on the drive, without hope of recovery. Don’t go to a heart surgeon first; try the general practitioner, as you might just have indigestion and not need a heart-lung transplant. Q.: If you tell Disk Utility to do a repair, it does a check anyway, so is there any point in doing a check? A.: Using the Disk Utility First Aid tab to Check Disk is faster, and it gives you a chance to contemplate the results before trying a repair. If you go straight to Repair Disk, it takes longer, and most of the time there is nothing to repair. On the other hand, if Disk Utility reports a general drive failure and advises you to back up everything immediately, you don’t want to attempt a repair (since this writes data to a drive that is dying); you want to get out the lifeboats and save everything you can, immediately. Q.: I have an older Apple that won’t go to sleep. I’ve taken it to a Genius at the Apple store, and it still won’t work. My questions: do you know of a way to fix the sleep problem? And: if the Genius can’t fix it, should I go to another Apple store? A.: Taking your second question first, I’ve never used an Apple Genius, but I do know something of their technique: they go for quick solutions. There is much demand, and they want to keep people waiting as little as possible. So they will replace a “dead” drive that may, in fact, be recoverable – given hours and hours of time. They will reformat drives and reinstall Mac OS X rather than run days of tests trying to track down a problem. They handle the vast majority of problems very quickly and skillfully, but if your problem requires a vast commitment of time, or if you put too many conditions on your request (“I want you to recover all of my data on my dead drive, upgrade Mac OS X, and rearrange my iTunes library in 20 minutes”), the Apple Store Genius Bar may not be the best solution. As for the sleep problem, this is very rare in Mac OS X 10.4 and 10.5; I haven’t seen this since the days of 10.2. If this machine were running Mac OS X 10.2, the best solution is to install Mac OS X 10.4, if possible. [It is Mac OS X 10.2.] It is 10.2? Then if you can’t install Mac OS X 10.4, reformat the drive and reinstall Mac OS X 10.2 from scratch. If you have a Mac OS X 10.4 or newer machine with sleep problems, reset the parameter RAM (PRAM). PRAM stores things like the time, time zone, and other items you want to remember between shutdowns. If the PRAM gets corrupted, it can interfere with the machine going to sleep, or waking up from sleep. You reset PRAM by holding down the Command-Option-P-R keys as your machine boots, and waiting for the boot cycle to play the boot sound twice. Q.: How do you edit something on the Mac and use it on Windows under Parallels? A.: Parallels allows you to set up Parallels Shared Folders. This is essentially a Parallels addition to Windows that allows Windows to see a Mac directory as if it were a Windows directory. Since Parallels runs as a Mac OS X task, Mac OS X and Mac applications can readily access this folder. Windows, unaware that Mac OS X even exists, can also access the folder, so you can freely exchange information between the two. By storing all your data in shared folders, you can also greatly reduce the size of the Windows disk image. Q: When I’m typing in Apple Mail, Address Book keeps filling in the To: address with bogus or outdated E-mail addresses. I looked in Address Book and can’t find these. How do I get rid of these? A: Those outdated addresses are not added by Address Book, but by Mail itself. It very thoughtfully caches addresses you’ve used in the past so that you can send these recipients something new. You can edit this list, deleting addresses you don’t want kept or even adding addresses to your Address Book. Open up Apple Mail, and under the Window menu item, look for Previous Recipients. Q: There are a lot of third-party utilities to do maintenance on your Mac’s hard drive, such as Drive Genius, Data Rescue II, Tech Tool Pro, and DiskWarrior. Is there anything that compares these utilities and what their specific capabilities might be? Q: I have a third-party keyboard and I’ve noticed that I can’t do a parameter RAM reset (Control-Option P-R). A: That’s true. If you use a KVM (keyboard-video-mouse) switch, the switch may also prevent Mac-specific interrupts (manufacture-specific hardware commands) from working. In those cases, you will need to at least temporarily replace the third-party keyboard with an Apple keyboard, directly connected to the Mac. Q: Do you have a recommendation of Parallels or VM Fusion for us on the Mac if you want to run Windows? A: The IT community tends to be very fond of VMWare Fusion, mostly because the IT community tends to be Windows dominated and VMWare has produced virtualization software for Windows for several years. Most Mac users, however, are more familiar with Parallels, which came out first and seems, at the moment, to be a bit more polished and Mac-like. Both work very well if you have an Intel-based Mac and you want to run Windows and Mac OS X at the same time. Q: What about defragmenting a hard drive? A: This isn’t necessary; Mac OS X automatically defragments drives. Most of the defragmenting literature – and utilities – dates from the time of small (100 megabyte and smaller) drives. These drives would get appreciably slower as more files were written to them and bits and pieces were scattered all over the place. Modern drives are far faster, have their own memory caches and CPUs, and vastly more capacity. These advanced capabilities, combined with Mac OS X’s built-in defragmenting capabilities, are usually all you need. If you are capturing high-definition video to disk, however, you may want a defragmented drive. The easiest, most reliable way to do this is: erase the drive. Obviously, this requires you to have a machine which can support multiple internal drives (a Power Mac G4, G5, or Mac Pro), or that you use an external FireWire drive that can be erased between projects. Defragmentation utilities have no real value in 2009. Q: I’m getting a message that my startup disk is almost full. What should I do? A: This is bad. Your Mac will run slowly and might not run at all if it runs out of room on the hard drive. Get rid of some stuff. This may seem obvious, but it is also vital. Mac OS X needs quite a bit of free drive space in order to operate. As a rule of thumb, you want to have at least two to three times as much free disk space as you have RAM, so if you have two gigabytes of memory, you need at least four to six gigabytes of free space on your drive. The Mac uses this space to temporarily store things when you have multiple programs opening, and programs use it for such things as the “undo” function in Adobe Photoshop. How do you make space? Drag photos, documents, movies and such onto an external FireWire drive, or archive items to DVD or CD-ROM. Depending on the machine, you may also be able to easily add an additional internal hard drive (Power Mac G4, Power Mac G5 or Mac Pro). Bob “Dr. Mac” LeVitus will be at the Pi on May 16 for a special Macintosh 25th Birthday event. He will talk about being productive with a Mac, and probably show off a variety of new pieces of hardware and software. The event is free. President Bob Jarecke announced the 2009 Washington Apple Pi Photo Contest, with a deadline of May 1 (subsequently extended to May 2). The contest classifications are the same as the 2007 contest (novice and advanced), and the subject areas are: Grouped People, Nature, Buildings and Structures, Travel, and Identified Flying Objects. Limited editing (cropping, burning, dodging, etc.) is allowed for most photos, but the Identified Flying Object can use any kind of editing. The contest will conclude on May 30 at the General Meeting with the presentation of winners in all categories, plus an overall winner. 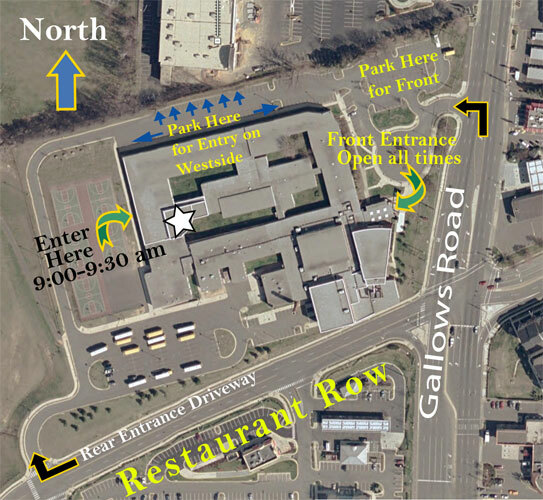 The meeting will be held at a new location: George Mason University. Check the Pi Web site for details. 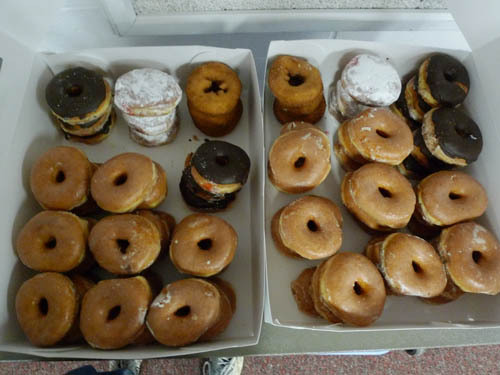 So many donuts. Gone so quickly at the March General Meeting. Photo by Dan Lehman. 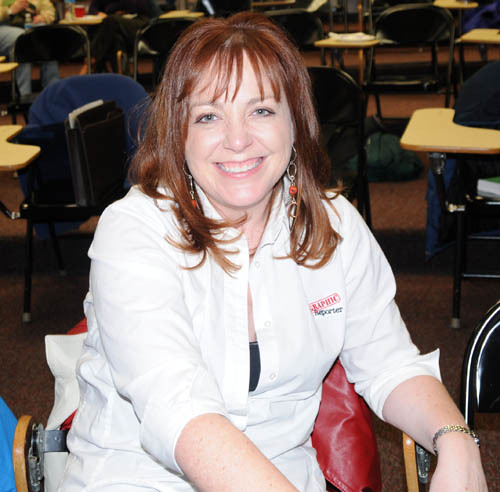 Lesa Snider King, graphics wizard, was our featured guest at the March General Meeting. Photo by Richard Sanderson. The main program featured Lesa Snider King. Lesa wasn’t sure, but she thought this might be her fifth trip to Washington Apple Pi, and as usual her understated expertise and engaging style were fondly received. The large audience was unusually quiet, paying rapt attention to her soft Texas accent as she made complex tasks look easy. Lesa came to promote her new book on Photoshop CS4, to promote iStockphoto, and to promote her Web site, blog and podcasts, but these were never the focus of her presentation. Instead, she talked about using Adobe’s Photoshop Elements 6 to easily create great photos from near misses. Adding a little extra to the presentation, she limited herself to some of the edits allowed for the Washington Apple Pi 2009 Photo Contest: cropping, burning and dodging, red-eye correction, correcting color cast, and adjusting brightness, saturation and contrast. 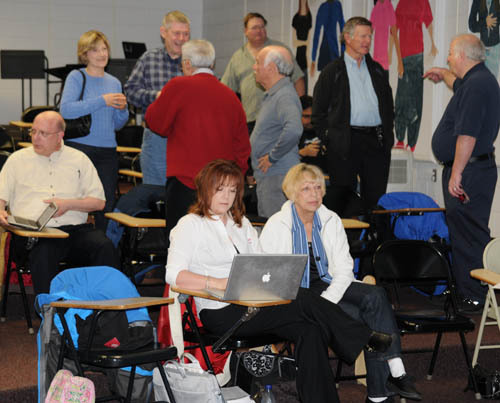 Lesa Snider King talks about her Photoshop CS4: Missing Manual book at the March General Meeting. This is her first book. Photo by Richard Sanderson. Drawing photos from iStockphoto (Lesa is an evangelist for iStockphoto), she demonstrated how the inexpensive Photoshop Elements ($89.99) is almost always a better choice for most users than Adobe’s much more advanced Adobe Photoshop Extended CS4 ($999). The sample iStockphoto illustrations were very good, but using nothing more than the simple tools in Photoshop Elements, Lesa showed, step by step, how to make them better. Part of the magic is the uncluttered interface of Photoshop Elements. There are fewer tools overall, as Elements drops high-end features such as CMYK and LAB color modes, many 16-bit and 32-bit tools, recordable scripting, several kind of adjustments, filters, layer masks, and pen and path tools. The missing features are almost exclusively used by high-end designers; your average Mac user won’t miss them, especially when they are trying to simply tweak a few snapshots. Lesa showed how Photoshop Elements operates in three different modes. In Full mode, all tools are available. In Quick mode, the most commonly used tools are presented. In Guided mode, context-driven “guided” steps lead the user through a series of actions. This modal approach reduces screen clutter, and makes it far more likely that the user will perform an action correctly, in the proper order following the proper steps. An “expert” mode is also context driven, but allows the user to override the choices presented. Lesa demonstrated this by using the crop tool to show how Elements automatically limits available filters to those that make sense for a crop. The Guided mode steps you through a simple crop, limiting you to either the most common photo sizes (3x5, 4x6, 5x7, 8x10) or to no limits at all. Toggling to expert mode allows for more nitpicky adjustments. Hovering over a tool with the mouse pointer usually pops up a short explanation of what a given tool or setting does. Lesa argues the red eye correction tool in Elements is better than that in the full Photoshop: it will find and fix the problem in one click, while Photoshop requires that you identify the suspect area first and then make adjustments. In something of a sidebar, she also mentioned the very logical keyboard shortcuts used in Elements. In a dialog box, “D” means “don’t save,” “C” triggers “cancel” and “S” means “save.” Elements lacks the hundreds of keyboard shortcuts found in the full Photoshop and instead consistently uses a select few that will both speed up your work and be a minimal burden on your memorization abilities. Color correction is simple in Elements. A guided edit mode allows you to simply select any part of a photo that is supposed to be black, white or gray. Elements then magically recalculates the rest of the image relative to this spot. You can click around on different places to adjust the color correction if it doesn’t seem exactly right. The effect is dramatic, and quick. Photoshop, in contrast, requires you to pick out something that is white – gray and black or not options – or painstakingly mix your own corrections. Photoshop Elements 6 has, as Lesa pointed out, essentially the same support for camera raw (raw, uncompressed data saved by many high-end cameras) as does the much pricier Photoshop. This comes in particularly handy for photos that are under or over exposed, or that have contrast problems. In particular, you can get some of the benefits of fill flash (changing the intensity of midrange values) after the fact. Sharpening – the last type of edit you should undertake with any photo – is also quite easy in Elements. She gave three sets of sharpening values for three different types of photos. For a fuzzy subject: amount 150%, radius 1, and threshold 10. For portraits, amount 75%, radius 2, and threshold, 3. For “things that need sharpening,” amount 120%, radius 1, and threshold 3. Naturally, these values make more sense if you have Elements, and individual tastes will differ. Her presentation was intermixed with advice on printing (use good paper, use good inks, be aware that prints use reflected light while your monitor is transmitting light, so results will be different); on using Elements as an external editor to iPhoto (this can be set using an iPhoto preference); on blemish removal (“the healing brush tool is a girl’s best friend”); and on using layers as a means of preserving the original and giving you the ability to undo major changes. The audience was invited to ask questions, and peppered her with dozens; surprisingly, she managed to answer most of them and still stay both on topic and on time. 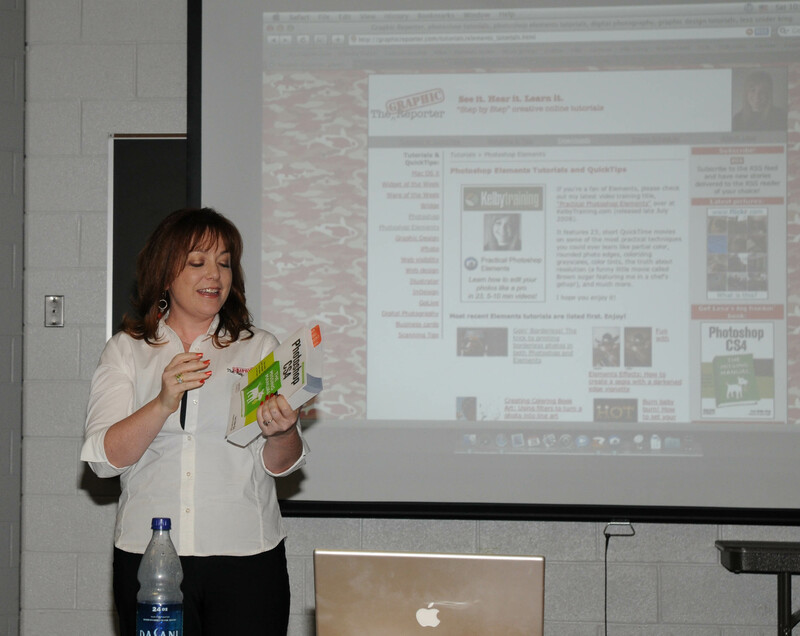 Virtually all of the features she demonstrated are covered in online tutorials on her Graphic Reporter Web site. If you missed the meeting, well, that’s a shame, but a visit to her Web site reveals a wealth of topic-specific tutorials on Photoshop Elements, plus lots of other topics. 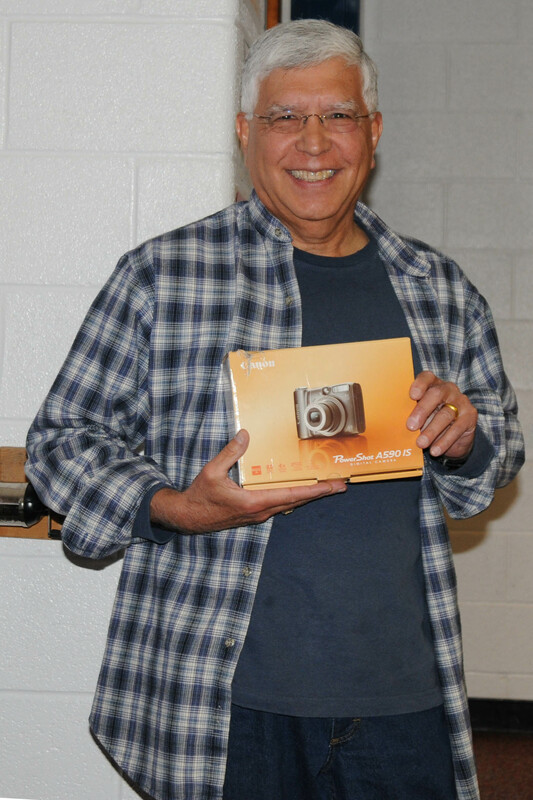 Jay Castillo had the winning drawing ticket for a Canon PowerShot A590 IS digital camera at the March General Meeting. Photo by Richard Sanderson. 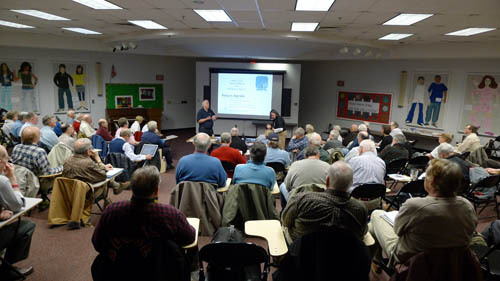 Graphics wizard Lesa Snider King returns to Washington Apple Pi to talk about editing photos. Lesa will show us how to do image edits using Adobe’s Photoshop Elements 6 for Macintosh. She will show how the following can enhance your already “best” images: cropping, burning and dodging, red-eye correction, sharpening the image, correcting colors to natural colors (removing the unholy green cast caused by fluorescent lights, for example), stitching photos together to create a panorama, fixing perspective correction (skewing), refining brightness, contrast and saturation, and converting a color image to a sepia image. And more. Apple Pi current members, including those living in the greater DC metropolitan area as well as those living across the country or around the world, are invited to participate in the 2009 Pi Photo Contest by attending kick-off presentation at the March 28, 2009 General Meeting. Contest organizers are looking for more participants and more images in 2009. Each photographer may submit a maximum of ten “best images.” Contestants compete against their peers by choosing their skill level: novice or advanced. The 2009 contest has five subjects/categories -- four of which allow use of the limited edits demonstrated by Lesa Snider King on March 28. The session will also explain what needs to accompany image files, the submission process and other contest rules. 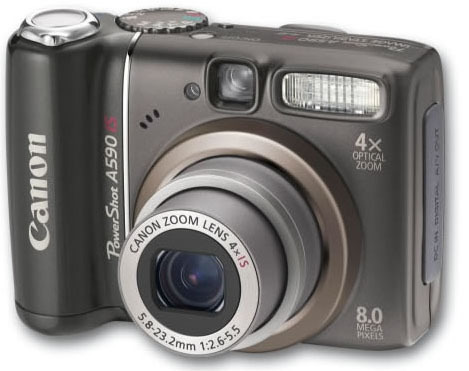 A Canon PowerShot A590 IS digital camera will be raffled at the March 28 general meeting; Five dollars per raffle ticket, three tickets for ten dollars.